I’ve heard it before. I’ve been hearing it for years, in fact, but with the recent ER visits for an infection around my central line and the days of IV antibiotics and re-assessment that followed, I heard it five times from five separate doctors all within one week. Gastroparesis and autonomic dysfunction are common co-conditions in diabetes so after all these years I now fully expect to be asked this question. During that same week, a triage nurse commented on how I was so young to have so many random health problems. A nurse in interventional radiology asked me what the plan was for getting me better and back to normal life. And an ER nurse’s eyes welled up with tears after she took my lengthy medical history and then realized we were the same age. Again, these are all really common and understandable responses. Health care workers are more accustomed to seeing complicated chronic conditions in older patients, not patients in their 20’s, like me. It probably doesn’t help that despite having recently turned 24, I’m often mistaken to be 15 or 16 years old! All of these reactions are usually followed up the same way. Why? Why do you have this? Why is this happening to you? Why aren’t you getting better? Why isn’t your age allowing you to just bounce back? For six years I haven’t had an answer, but now I have one. 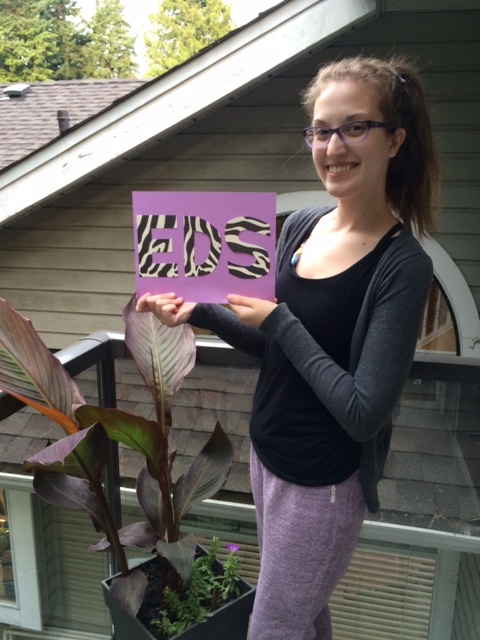 I have Ehlers-Danlos Syndrome. I have an incurable connective tissue disorder that affects my joints, blood vessels and organs. I’m not going to magically get better and it’s possible that things might get worse. To be clear, I’m not celebrating the incurable-not-getting-better-but-maybe-getting-worse part. That part is as overwhelming and frustrating as it sounds. But that part really isn’t anything new. Sure, we didn’t know what was causing all of my problems but it was well established that my illnesses were chronic. It was understood that there would be ups and downs, highs and lows, but that I would be tackling health struggles for the rest of my life. And that hasn’t changed. Next time I meet a new doctor and they ask me why all of this is happening to me, I will have an answer. Next time I wonder if my illness is something I brought upon myself and could have prevented, I will know that’s not the case. And next time I experience some bizarre new symptom and I want to pull my hair out wondering why my body is so strange, I’ll know that strange is just par for the course and that it’s not just all in my head. When I first learned about Ehlers-Danlos Syndrome over two years ago I immediately thought, “I think I have that.” However, as many chronic illness patients know, most doctors don’t really appreciate it when we diagnose ourselves and then ask for the tests or referrals to confirm it. It took a lot of casual mentions, strategic asking of opinions, polite acceptance of brush offs, insistent re-mentions and then, as always, months and months of waiting. Now that I have a diagnosis, I also have a reminder to trust my instincts and never stop advocating for myself. This diagnosis brings a lot of peace of mind and ah-ha moments. Yes, now I know why I can’t eat and why my body sometimes forgets how to stand up, but there are so many other things about my life that all of a sudden make sense! Now I know why my dance teachers used to get after me for having ugly elbows, loosey-goosey shoulders, and knees and ankles that didn’t line up properly. Now I know why I hold my pens and pencils differently. And now I know why my family used to give me strange looks when I couldn’t finish my steak because chewing was just too exhausting and painful (apparently not everyone feels like their jaw is going to fall off while eating steak?). There is a long list of little things that all of a sudden make a lot of sense since this very important piece of the puzzle has been added. So no, I’m not happy about all of the struggles future me has to deal with, but I am happy to have a better understanding of all of the struggles I’ve already faced. I’m happy to have some answers. I feel heard and I feel validated. I feel empowered. And that is why I am celebrating. 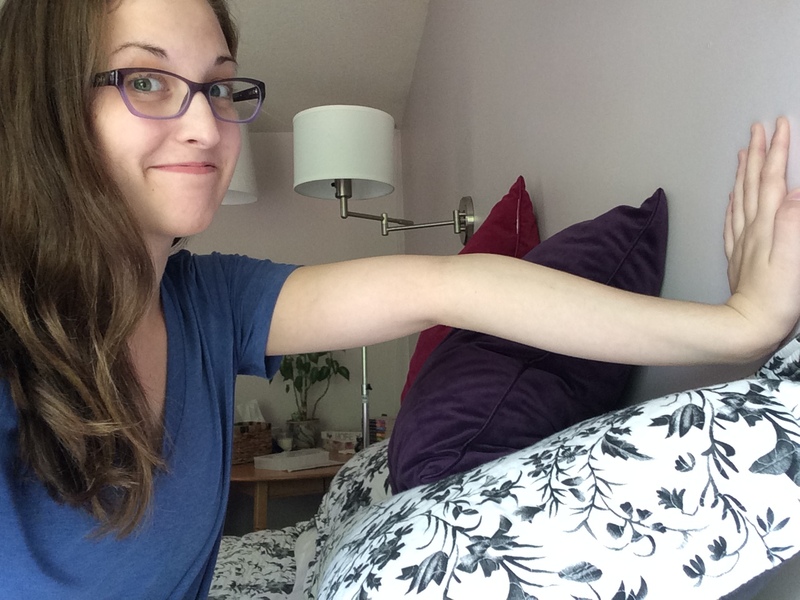 Ugly elbows and all! Oh my – I can’t believe the doctor had to google lupus. Maybe she was googling it more to make sure any treatments she prescribed weren’t going to have adverse effects? Who knows, but either way I’m glad you’re glad you’ve got your answers! Congratulations on your diagnosis. As a parent of a teen with Asperger’s and a child with autism, I actually DO get it. When my kids were diagnosed at Children’s hospital it gave me a whole slew of tools and resources to better understand and help my kids. A diagnosis also gave me a valuable common language and starting point to enable others, to help my boys. Massive kudos to you also for persisting in figuring it out.. Massive kudos right back to you! Your kids are lucky to have someone like you advocating for them and fighting for their future. Thank you – I’m glad you’ve found some relief and answers as well! Congratulations on receiving your diagnosis! I know what a relief that is. Isn’t it astounding how those three words, Ehlers-Danlos Syndrome, tie most of our seemly random ailments together? I could’ve nearly written your post myself! I was just diagnosed with EDS in May, at age 28, after six years of searching for answers. The diagnosis really does make a difference in the care we receive. Hugs to you from a fellow Zebra! Thank you – congrats right back. It’s totally astounding how one diagnosis can connect the dots between so many “I must be going crazy” symptoms. Hugs back! As someone said to me when I finally got my EDS diagnosis this summer, congratumiserations! (I love that word, even if it isn’t real! Your feelings so echo mine as I’ve found out about EDS. While I don’t have some of the more severe versions, it has been something that has changed me so much, and the process of finally getting understanding is fantastic. When I read this post today in The Mighty, it just struck a chord with me. I like reading other blogs that resonate for me. I’ll have to keep following. If you’re at all interested in following me too, I’m at http://www.switchingseats.net and also have FB and Twitter feeds, although I’m not as twitter faithful as I am FB. Thanks again for sharing your journey. I’m sure you will help many! I’d love to keep in touch! Hey Jana! (I’m now connecting the dots between your tweet and this comment) I love that word – congratumiserations – and I’m definitely going to find occasions to use it 😉 Your blog isn’t loading for whatever reason but I’m going to try again in a little bit because I’d love to read more about you! Oh! And congratumiserations to you back on your own recent diagnosis! I have congenital hydrocephalus, which my well-intentioned parents never told me about growing up (!) As I learnt to figure things out on my own, I began to have -some- inkling about things, but was never officially told about it until recently. In the time between figuring things out & being officially told, I created a safe & comfortable (while not inaccurate either) label that I simply called “bad psychomotor coordination”. Having found out what it was precisely helped things a Little Bit, cos now I could use words to describe myself. But that wasn’t the complete picture, cos I knew what things were – but still wasn’t aware that it was a Medically Documented condition, with Statistics to prove it. I thought it was just me/one in a million, like if you were born with seven fingers instead of 10, a cleft palate & a missing leg or something (arbitrarily illustrating here, but the point is – you can know you’re different, & have the vocabulary to describe it but still feel alone/incomplete cos you feel you’re the only one experiencing this, like you are a Perinatal Fluke. So yes, I knew what the condition entailed, but spent two-ish years holding that knowledge yet still feeling like a Fluke. About a month ago, I was reading an article on The Mighty about sensory overload, something I’ve been experiencing as a result of GAD & only recently been able to identify in words. Haha I initially thought it was called Misophonia, closest but inaccurate description as it was. But I digress – on one article I was reading came a comment of someone else who had hydrocephalus & was explaining her own sensory overload as well, how she was considering that in relation to hydrocephalus, which she also has. 💡💡💡 lightbulb moment – wait– what– ?! time to engage in Google-fu! & I’m stunned – wait- waitaminute– you can -acquire- this !? It has documented statistics!?! It is Incurable !?! You see – for the longest time my parents were hoping for a cure, something/ANYTHING! to make their daughter better. In turn, this daughter kept wondering – if only I did this, did that – would the post-surgery outcome have been better, would I have made my parents more proud of me? Maybe they’d be less disappointed now, maybe if only I agreed to this-or-that-arbitrary-intervention they might be less disappointed … it might work? But now I can say firmly – no, all these seemingly “unsuccessful cures” that made them so Disappointed, were Not My Fault. I’m glad you’ve found some peace in your incurable diagnosis, as well! It can be a big relief to not keep having to ask and wonder why, when, what…etc. Thank you so much for sharing this information Catherine. happening to your health. Something you figured out over two years ago. Like you say…. trust your instincts…. always. Wise words from an incredibly strong and wise woman. You are a true inspiration, you remind me of my own daughter that has cf. I understand the ups and downs and yet you both, (you and my daughter! ), have such awesome attitudes. Even when you have a bad day you look at the bright side. My daughter is a real hero to me because she does not let anything slow her down. If it is not cf related diabetes, it is her gastroperesis or her asthma or whatever, she just looks at the positives and keeps going. As a dad i try and act like everything is fine and whatever happens everything is going to be fine but truth be told, it scares the hell out of me. Thank you for being so positive, it is very uplifting. I only wish i could have the same positive cheerful attitude that you both share. I won’t continue to ramble, take care of yourself. Hi Dave – thanks for the comment! I understand where you’re coming from because I know that it often seems harder for my mom to watch all of this happen to me than for me to actually go through it. But I know that Jen is really lucky to have someone who loves her and cares for her as much as you do. Hugs to you all! Congratulations seems utterly inappropriate, but glad you have some answers! Love the internet for carving that path for me! Hi Catherine – OMG Congratulations – in that weirdest kind of way!! What a beautiful, ridiculously helpful, comforting-despite-it-all thing to finally have a diagnosis. Thanks for sharing this and wishing you oh so much luck and more joy with the validation and the reality that following your gut and being patient and sticking with it have brought you. Thank you! I was in IR having a central line placed on Thursday and afterwards one of the nurses asked me why all of this stuff was going on with me and I had a concrete answer for her. It was great!